Registration is open through January 31st, no late registration; no exceptions. Match play start time can be as early as 7:00 a.m. or as late as 5:00 p.m.
Clinics held on Saturdays; Match play held on Saturdays and Sundays. Grades 7 & 8 travel to various courses throughout West County. All golf players must have their own golf clubs and accessories. Big League clinic schedules generally posted early-March. Match schedules generally posted in mid-April. 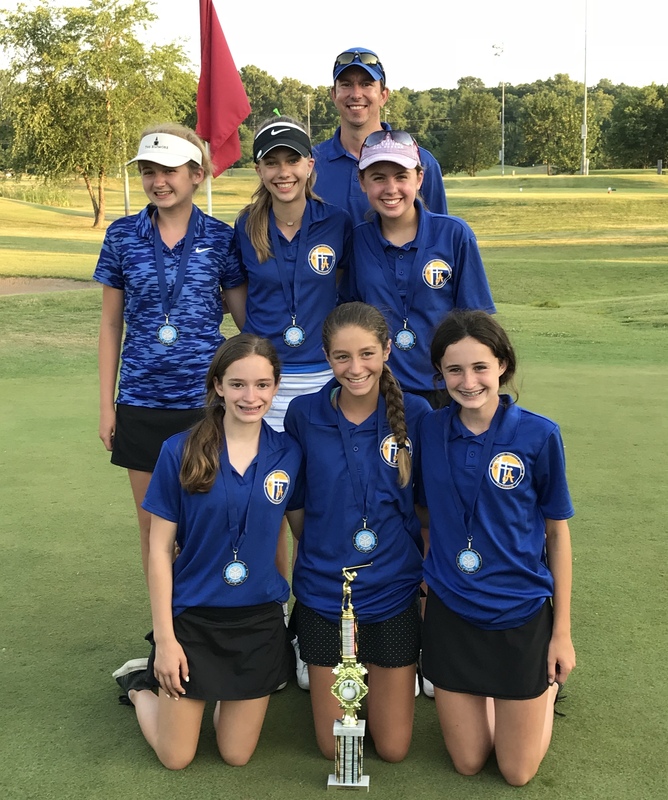 All boys and girls, Grades 1-8, are eligible for participation in the golf program if the child's family is a registered Member of Ascension Parish, lives within the Ascension Parish boundaries, or attends Ascension School. (unless your parish does not have a program). No experience necessary; scoring is optional; non-competitive program; for the beginning golfer. Six 55-minute professional golf lessons with the team. Teams are composed of 6 to 8 golfers (8 is the maximum). Use the comment section during registration to place individuals on teams in which they might have a friend they want to play with. We do our best to accommodate but this is not a guarantee. This is a great opportunity for your kids to make new friends. No experience necessary; and while there are matches and tournaments, please keep in mind this is a recreational league for ALL skill levels. Score keeping and golf etiquette reinforced. A CYC Sports Youth ID Card is REQUIRED for this league. If a team has fewer than 8 players, they will be combined with another parish team. Refund requests during the registration period will be granted, less a $10 administrative fee. Refund requests during the late registration period will be granted, less 50% of the original registration fee. Uniform details will be sent to parents via email. The uniform consists of a Ascension polo shirt (and optional hat), available at Fischer’s for $12. Players must have their own clubs, tees, and balls. Follow West County CYC Youth Golf Program on Facebook to receive updates for weather delays, cancellations, etc. We will need one Team Leader per team. It is rather common to hear parents say, "I don't know anything about golf; I cannot help." Team Leaders act as the head communicators - what parent doesn't already do this? Team leaders will not have to give any golf instruction, and will act as the liaison between the parents and the parish Golf Director. We also encourage team leaders to set up practices for their team, and take advantage of range time. Without Team Leaders, everyone on the team is left in the dark. Why else is this role so vital to making this program highly effective and fun? A Course Manager is on duty to help Team Leaders with score sheets. All courses will have Marshals to help teams keep moving and reinforce rules. These two resources create a much easier job for the Team Leaders! Share scheduled related information with the players and parents throughout the season. Support your golfer and his/her team by attending golf lessons and course plays. At least one Team Leader is absolutely required, per team. This league has a 10 week commitment and the schedule can be split between two Team Leaders. Please review the timeline and details about this exciting CYC Golf Program to help you plan ahead. If interested, please check the Team Leader box during registration. We are very grateful to all who volunteer to help our golfers and their parents! This also fulfills your annual work duty commitment! For questions, please contact the Golf Director. External links are provided for reference purposes. Ascension Athletic Association is not responsible for the content of external Internet sites.